“ALBUQUERQUE, New Mexico (CNN) – With 10 days to go until election day, long brewing tension between Sarah Palin and key aides to John McCain has become so intense, it is spilling out into the public. We understand “where you’re coming from,” dear. 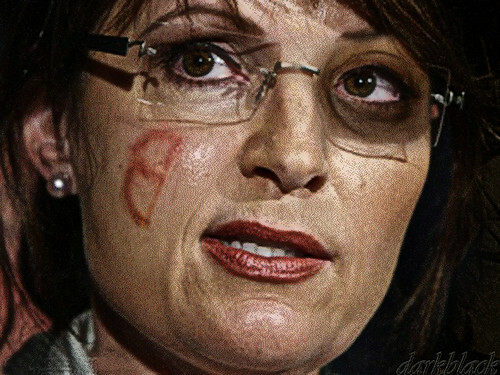 “McCain sources point several incidents where Palin has gone off message, and privately wonder if they were deliberate. For example: labeling robo calls “irritating,” even as the campaign was defending the use of them and telling reporters she disagreed with the campaigns controversial decision to pull out of Michigan. “A Palin associate defended her by saying she is “not good at process questions” and that her comments on Michigan and the robo calls were answers to process questions. But this Palin source acknowledged that she clearly is trying to take more control of her own message, pointing to last week’s impromptu press conference on a Colorado tarmac. Tracey Schmitt, Palin’s press secretary, was urgently called over after Palin wandered over to the press and started talking. Schmitt unsuccessfully tried several times to end the unscheduled session. “We acknowledge that perhaps she should have been out there doing more,” a different Palin adviser recently told CNN, arguing that “it’s not fair to judge her off one or two sound bites” from the network interviews. “If people want to throw me under the bus my personal belief is that the most honorable thing to do is to lie there,” said Wallace. Well you could always DRIVE, you know. But two sources, one Palin associate and one McCain adviser defended the decision to keep her press interaction limited after she was first picked, both saying flatly that she was not ready and missteps could have been a lot worse. They insisted she needed time to get briefed on issues on the national and international stage she was not familiar with and has never dealt with, and on McCain’s long record. Perhaps “Home Schooling” would help. Yet another senior adviser lamented the public recriminations. “This is what happens with a campaign that’s behind, it brings out the worst in people — finger pointing and scapegoating,” this senior adviser told CNN. This adviser also decried the double standard, noting that Obama’s running mate, Joe Biden, has gone off the reservation numerous times, most recently by telling donors at a fundraiser that America’s enemies will try to “test” Obama. Yeah you’ve gotta put him to the test! Tensions like those within the McCain-Palin campaign are not unusual; vice presidential candidates have a history of butting heads with the top of the ticket. John Edwards and his inner circle repeatedly questioned Sen. John Kerry strategy in 2004, and Kerry loyalists repeatedly aired in public their view that Edwards would not play the traditional attack dog role with relish because he wanted to protect his future political interests. Jack Kemp’s aides distrusted the Dole camp and vice versa, and Dan Quayle loyalists had a list of gripes remarkably similar to those now being aired by Gov. Palin’s aides. With the presidential race in its final days and polls suggesting McCain’s chances of pulling out a win are growing slim, Palin may be looking after her own future. But as the meat puppets keep telling us, a lot can happne in 11 days. Besides, I’m sure Sarah and John can work out their differences.